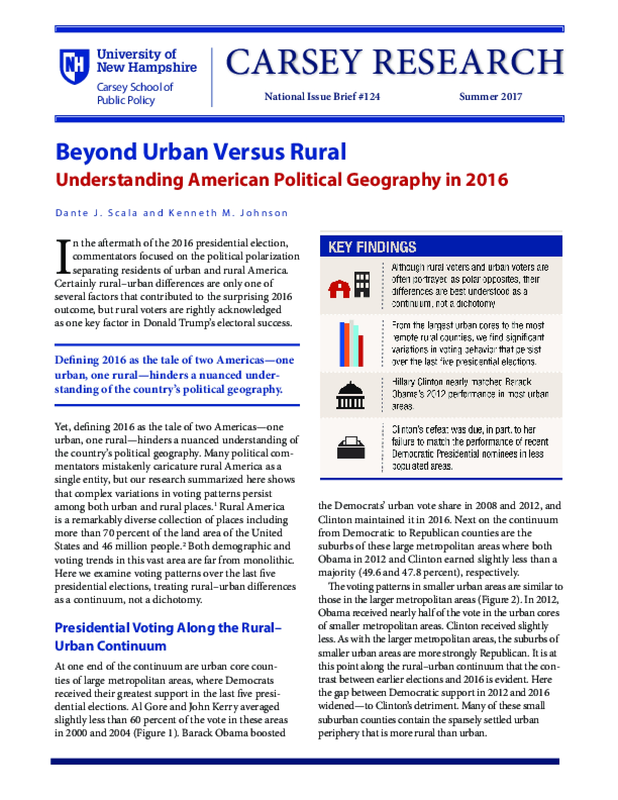 In the aftermath of the 2016 presidential election, commentators focused on the political polarization separating residents of urban and rural America. Certainly rural–urban differences are only one of several factors that contributed to the surprising 2016 outcome, but rural voters are rightly acknowledged as one key factor in Donald Trump's electoral success. Yet, defining 2016 as the tale of two Americas—one urban, one rural—hinders a nuanced understanding of the country's political geography. Many political commentators mistakenly caricature rural America as a single entity, but our research summarized here shows that complex variations in voting patterns persist among both urban and rural places. Rural America is a remarkably diverse collection of places including more than 70 percent of the land area of the United States and 46 million people.2 Both demographic and voting trends in this vast area are far from monolithic. Here we examine voting patterns over the last five presidential elections, treating rural–urban differences as a continuum, not a dichotomy.